High adventure spiral staircases: Zip lines, water parks, roller coasters, high dives, and theme parks all have elevated applications for spiral stairs. For over 40 years, Stairways, Inc. has been refining the manufacturing process of spiral stairs for elevations above the typical residential heights. Welded spiral staircases can be shipped in sections of 50' and stacked together to any height. A spiral staircase for these applications can be produced in steel, aluminum, or stainless steel. Coatings for these spiral stairs can be wet painted, galvanized, or powder coated. Coatings can include combinations such as galvanized and painted. 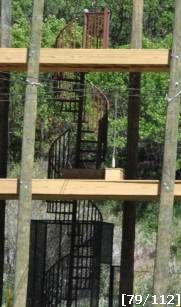 In many cases high adventure structures using spiral stairs have multiple exit points. Let Stairways, Inc. aid in the design of your spiral staircases. Contact our sales staff in the planning phase of your design, and let us show you how we can help with your spiral stair.